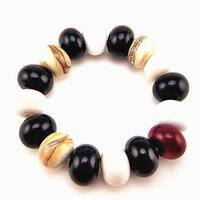 Unique, beautiful bead set created for use with your favorite I Ching book. They are easy to use, as accurate as traditional yarrow stalks with probabilities, and full of style too. All the beads used are hand made, one of a kind, and each set is created with care, and love. You choose each bead by running them through your fingers without looking and eventually stopping on one. The colour of that bead determines what type of line you draw. Each of the colours of beads occurs with the same probabilities as can be found using the traditional yarrow stalks (oldest method). Each colour signifies a different type of line to be made to build a hexagram. (Black is yin, white is yang, red is changing yin, and ivory is changing yang). Hexagrams are created from the bottom up - so the first line (first bead chosen) is the lowest line.